Trade News Bulletin -- Albemarle Corporation today announced that its zeolite-based AlkyStar™ catalyst successfully produced high-quality alkylate after start-up of the world’s first solid acid catalyst alkylation unit at the Shandong, China, plant of Zibo Haiyi Fine Chemical Co., LTD, a subsidiary of Shandong Wonfull Petrochemical Group Co., Ltd. The unit uses the breakthrough AlkyClean® process technology jointly developed by Albemarle Corporation, CB&I and Neste Oil. Start-up of the unit, which has a capacity of 2,700 barrels per stream day of alkylate production, was on August 18. Albemarle’s AlkyStar catalyst, together with CB&I’s novel reactor scheme, produces high-quality alkylate product without the use of liquid acid catalysts in the alkylate manufacturing process. Not only is AlkyClean technology inherently safer when compared to technologies employing liquid acids, there are also environmental benefits due to the reduction of waste streams such as spent acids and acid-soluble oils. Albemarle's AlkyStar catalyst, for use exclusively with the AlkyClean alkylation process, is based on an advanced new zeolite concept developed by Albemarle's R&D and is optimized to further improve the economics of the AlkyClean technology. PHOTO CAPTION: Albemarle’s zeolite-based AlkyStar™ catalyst has successfully produced high-quality alkylate at the world’s first solid acid alkylation unit in Shandong, China. 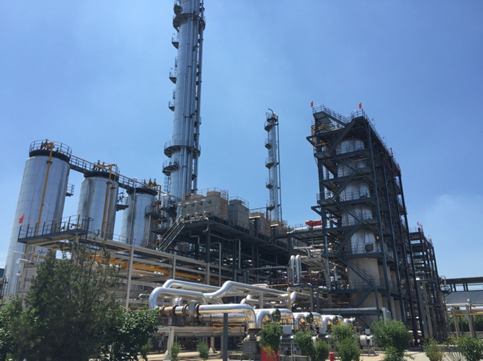 Photo provided by Shandong Wonfull Petrochemical Group Co., Ltd.
CB&I is the most complete energy infrastructure focused company in the world and a major provider of government services. Drawing upon more than a century of experience and the expertise of approximately 50,000 employees, CB&I provides reliable solutions while maintaining a relentless focus on safety and an uncompromising standard of quality. For more information, visitwww.cbi.com. Albemarle Corporation, headquartered in Baton Rouge, Louisiana, is a premier specialty chemicals company with leading positions in attractive end markets around the world. With a broad customer reach and diverse end markets, Albemarle develops, manufactures and markets technologically advanced and high value added products, including lithium and lithium compounds, bromine and bromine derivatives, catalysts and surface treatment chemistries used in a wide range of applications including consumer electronics, flame retardants, metal processing, plastics, contemporary and alternative transportation vehicles, refining, pharmaceuticals, agriculture, construction and custom chemistry services. Albemarle is focused on delivering differentiated, performance-based technologies that deliver innovative and sustainable solutions to its customers. The Company employs approximately 6,900 people and serves customers in approximately 100 countries. AlkyStar is a trademark of Albemarle Corporation. AlkyClean is a registered trademark of CB&I.